Group exhibition entitled 'Double Take: African Innovations', long-term installation, East Gallery / 1st Floor. Celebrating Africa’s continual dynamism and long tradition of artistic creativity, Double Take: African Innovations opens the doors to our storied African collection with a new, experimental installation that invites surprising and unexpected ways of looking at African art. It suggests universal themes that link seemingly dissimilar works, often across vast distances of time and space, while also presenting them within their own specific context of history and place. In the main Double Take gallery, nearly forty objects, including a number of recent acquisitions, are organized into fifteen pairs or small groups that explore themes, subjects, and techniques that recur throughout African history, including performance, portraiture, the body, power, design, satire, and virtue, among others. A deeper look into our extensive African holdings can also be found in an adjacent “storage annex” display of an additional 150 African masterpieces, with an area for making new connections and responding to the works, including suggestions for other themes. These responses will help shape a case with regularly changing objects, and will also inform the larger presentation of our African collection in the years to come. A temporary installation planned amid an extensive renovation of our first floor, Double Take: African Innovations is the next phase in the ongoing expansion of our African collection. 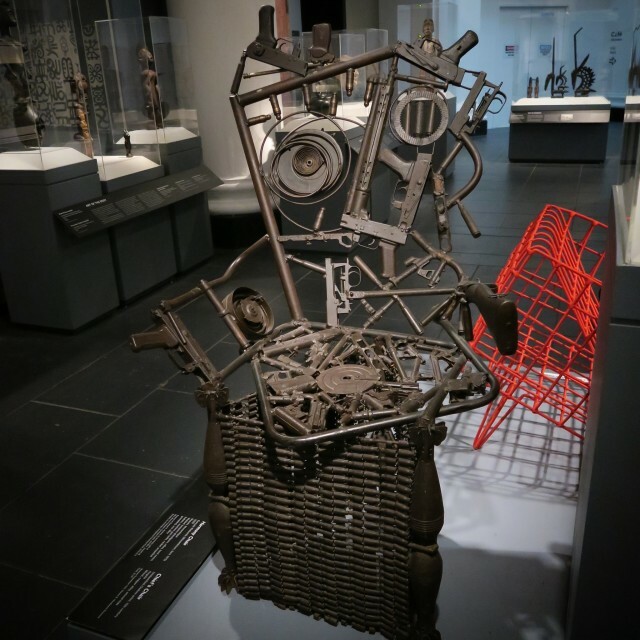 It builds upon the previous installation, African Innovations, our first chronological African presentation, by exploring further connections between African artworks. Double Take: African Innovations is organized by Kevin Dumouchelle, Associate Curator, Arts of Africa and the Pacific Islands, Brooklyn Museum.